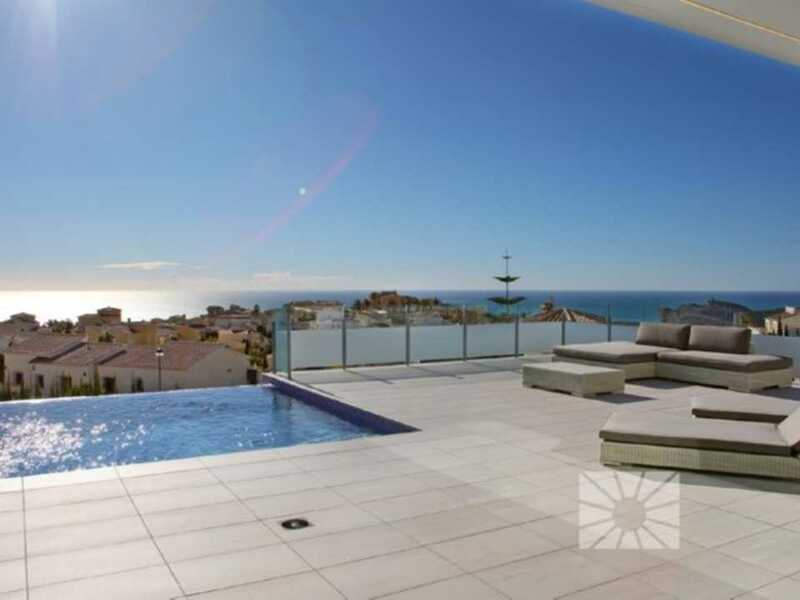 Exclusive villa with a modern design located in the Lirios Design development at the Residential Resort Cumbre del Sol. 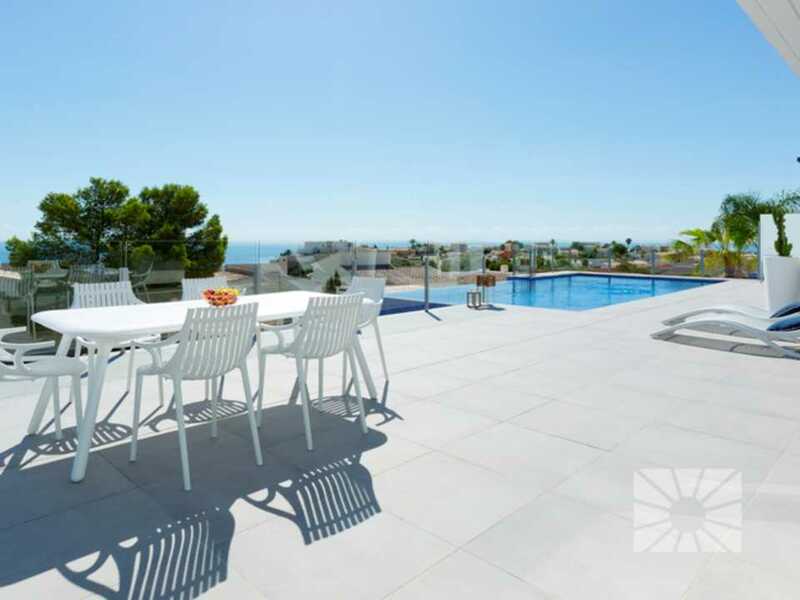 A consolidated residential zone on the Costa Blanca with marvellous views over the sea and excellent climate that can be enjoyed throughout the year. 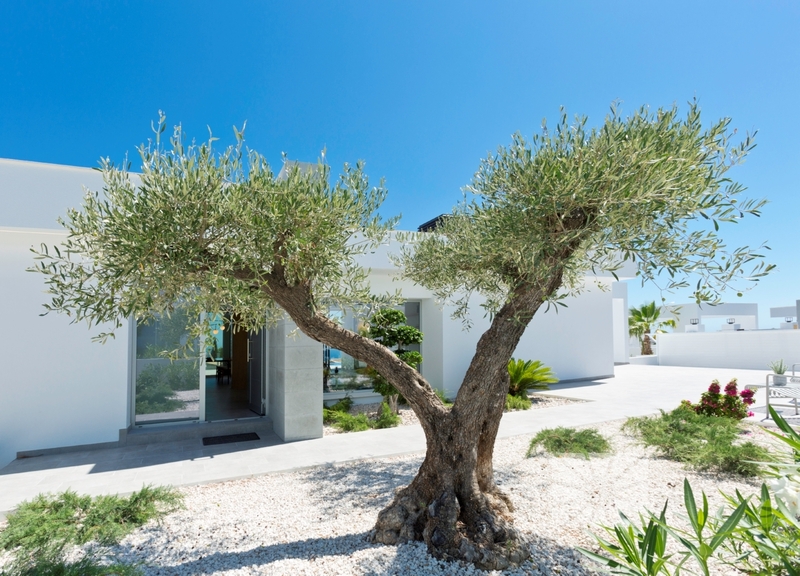 Villa Rodas’ distribution has been designed to fully take advantage of its setting with the backdrop of the sea and the Mediterranean light present in every room. 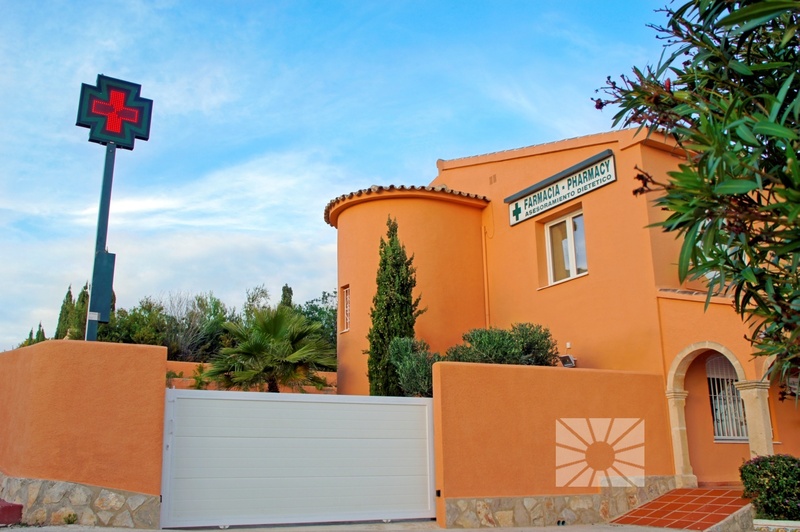 The villa has 3 double bedrooms, with spacious wardrobes, two of the 3 bedrooms have their own terrace and the master bedroom has an en-suite bathroom and direct access to the main terrace and swimming-pool. The one-storey distribution is rounded off with a spacious lounge where we can enjoy the views offered by this home, a dining room, fully fitted kitchen, a second bathroom, terrace with infinity swimming-pool, porch, in addition to the hall and a guests’ bathroom..
A villa that stands out for its original design adapted to a plot with a unique location that guarantees all the benefits of the Mediterranean climate at the Residential Resort Cumbre del Sol on the Costa Blanca. 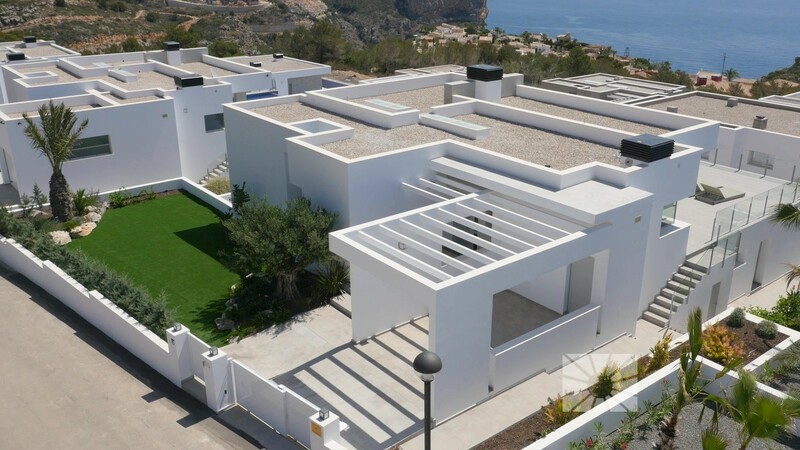 Lirios Design is a development of modern style detached villas designed on outstanding plots within the Cumbre del Sol residential estate, in Benitachell, between Javea and Moraira, on the North Costa Blanca. 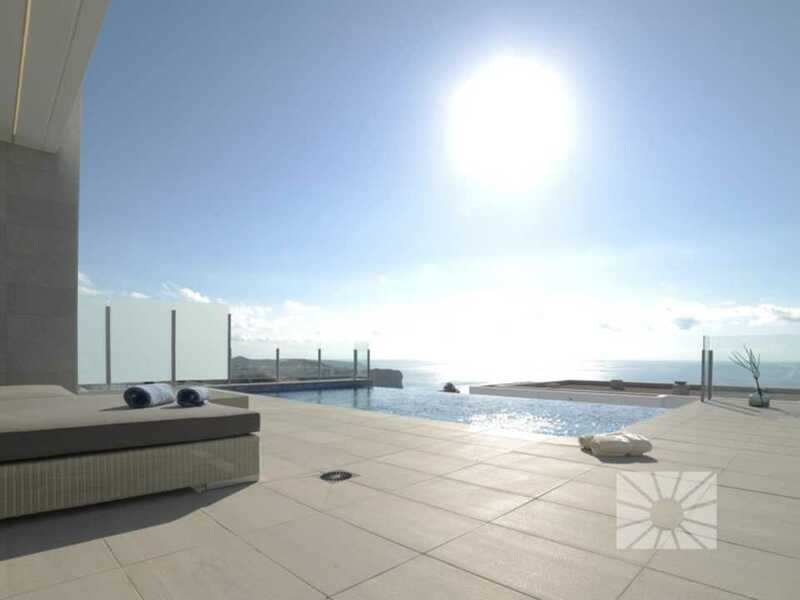 Model Mikonos, homes with total built areas of 358.25sqm, situated on plots of over 740sqm, and with a layout over two floors. With 3 bedrooms and 2 bathrooms (master bedroom with en-suite bathroom and fitted wardrobes), spacious living room, fully equipped kitchen, utility room and covered parking with pergola that connects directly to the main access to the house. 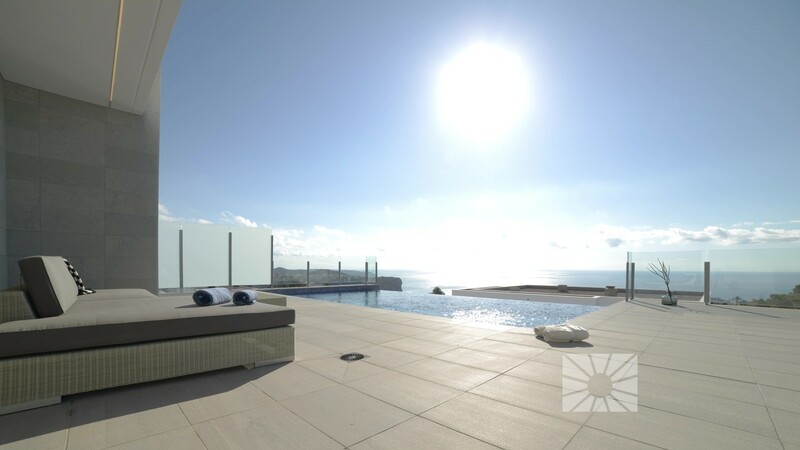 The large expanse of terrace, with 77.60sqm with the infinity edge swimming pool is an important feature of this villa design, which also has an open plan semi-basement area of 80.85sqm which can be turned into an additional bedroom, gym, studio apartment, etc. 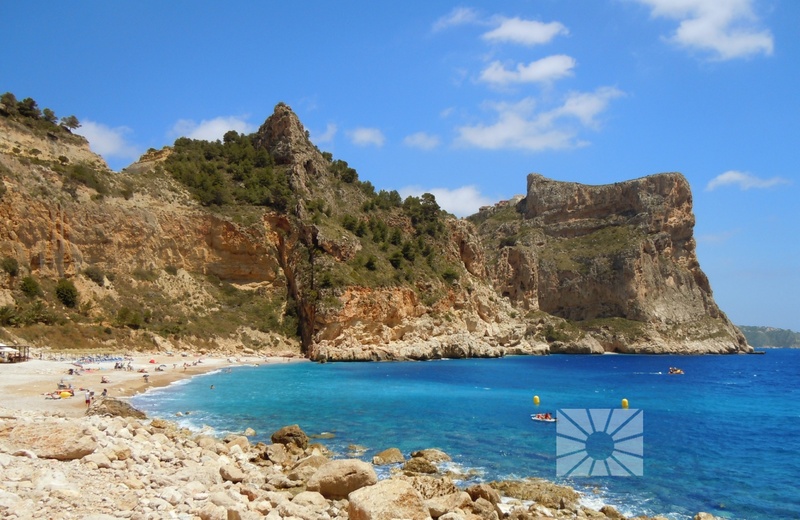 All these villas are south-east facing and enjoy fantastic sea views. 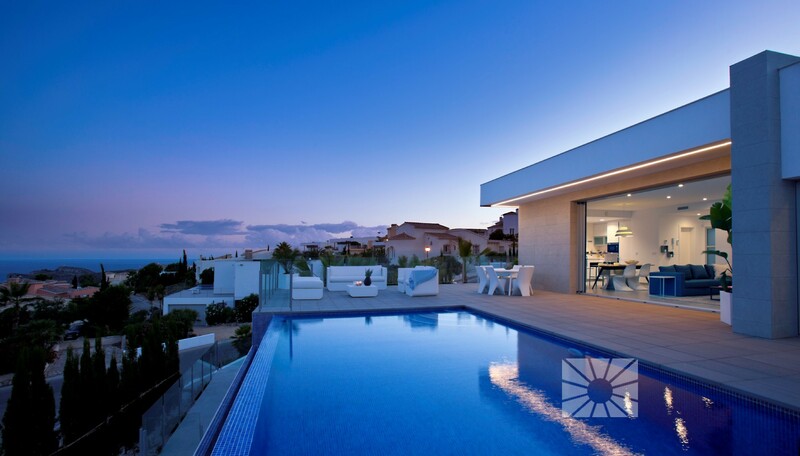 Model Santorini, homes with total built areas of 222.95sqm, situated on plots of over 750sqm. Single storey properties with 3 bedrooms and 2 bathrooms (master bedroom with en-suite bathroom), fully equipped kitchen, utility room and spacious lounge-dining room with direct access to the terrace and pool area. 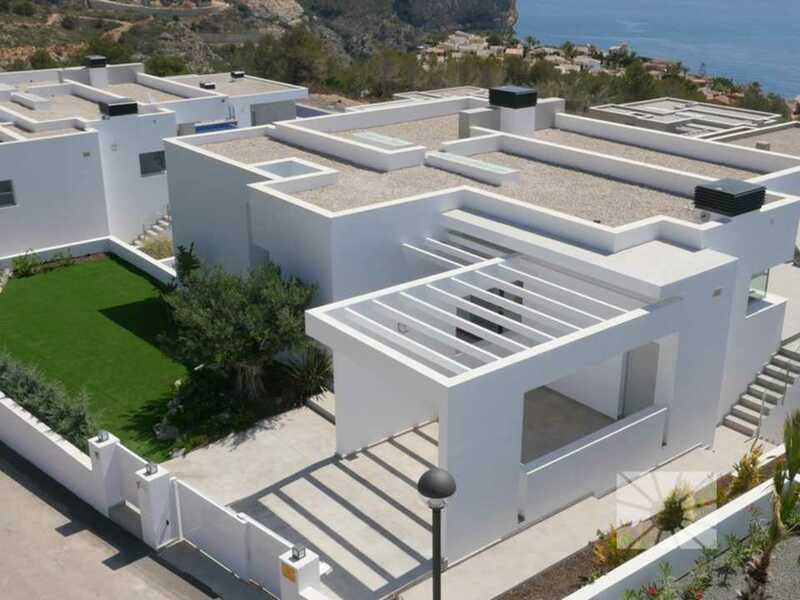 These villas also have a parking bay and are southeast facing. 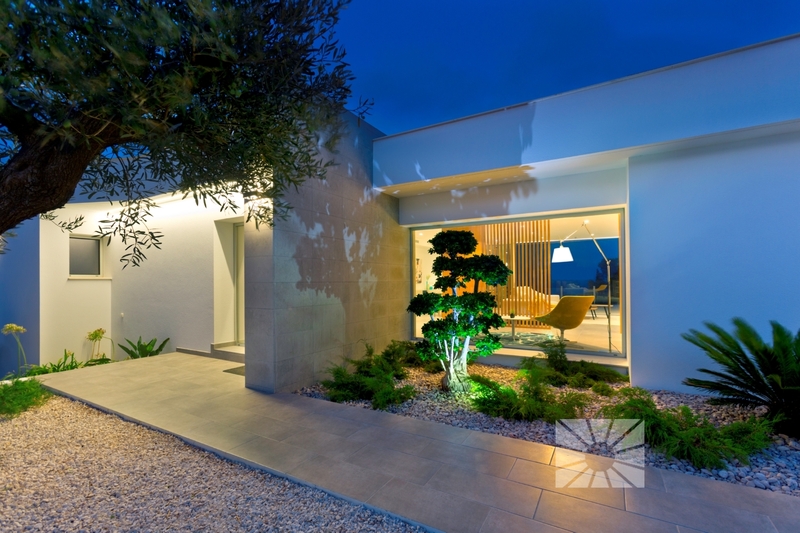 Model Samos, homes with total built areas of 363.15sqm, situated on plots of over 760sqm, spread over two floors. With 3 bedrooms and 2 bathrooms (master bedroom with en-suite bathroom and fitted wardrobes), spacious living room, fully equipped kitchen, utility room and covered parking with pergola that connects directly to the main access to the house. 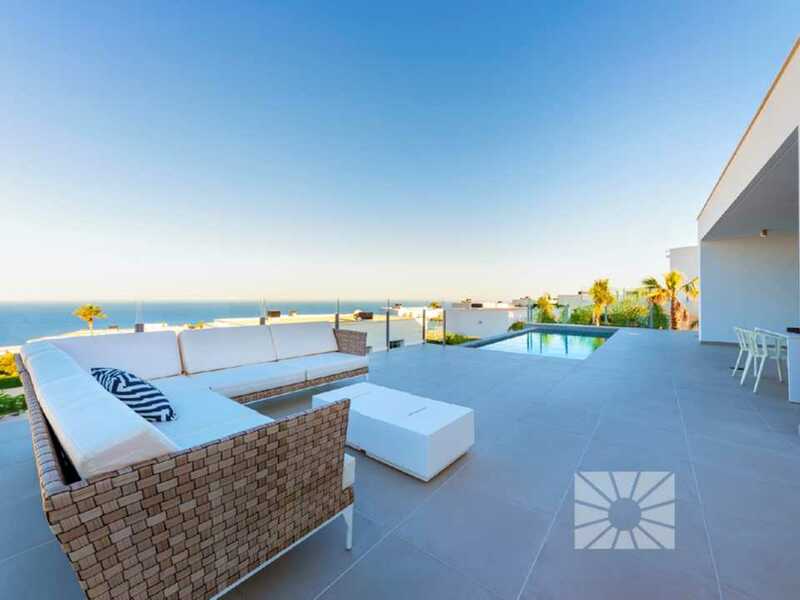 The large 64sqm terrace which houses the swimming pool is an important feature of this villa design, which also has an open plan lower level with an area of 86sqm which can be turned into an additional bedroom, gym, studio apartment, etc. 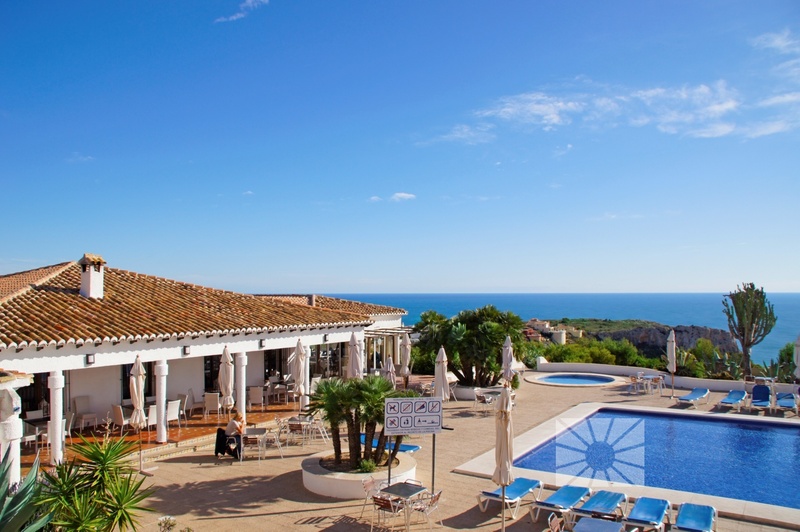 All these villas are south-east facing and enjoy fantastic sea views. 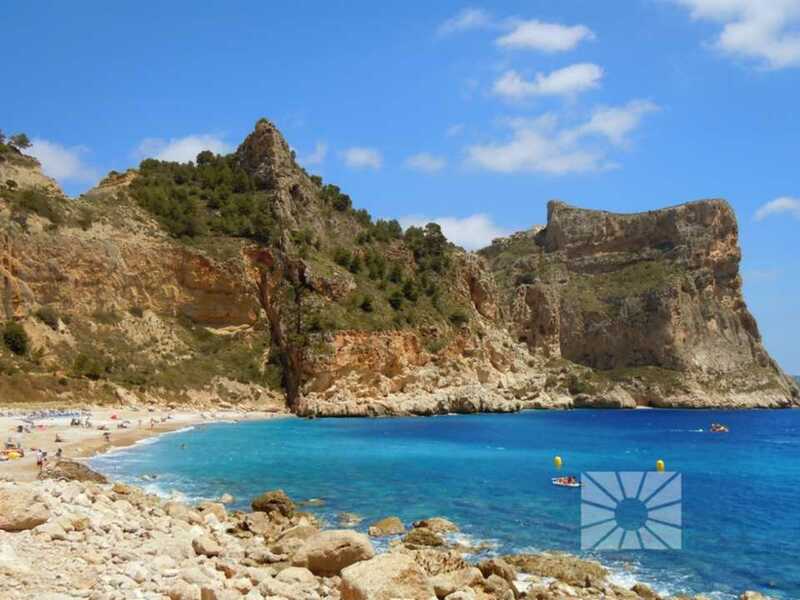 Villas currently being built, situated very close to the South entrance to the urbanization, with direct access from Moraira and with all the services that the Cumbre del Sol residents enjoy. 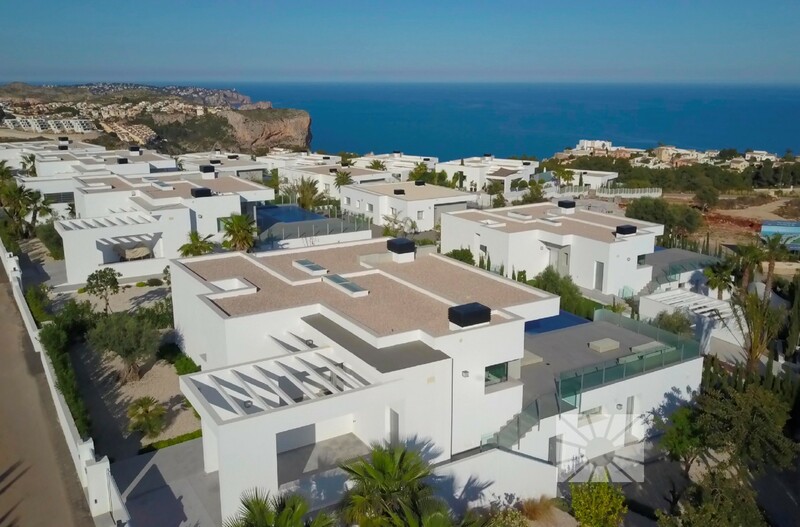 Lirios Design is a residential area within the Cumbre del Sol urbanization, of individual villas, each with its own plot with boundary walls, parking area, private swimming pool and garden. 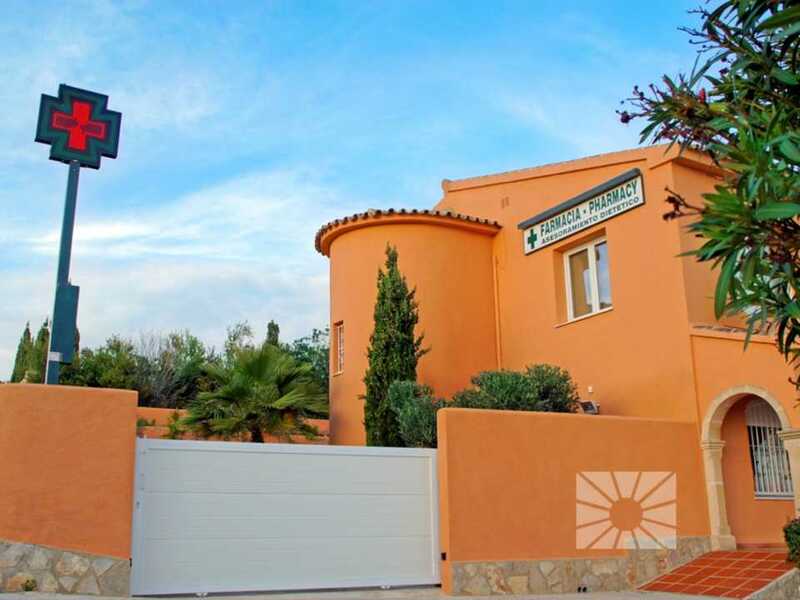 Villas which enjoy all the services available within the established Cumbre del Sol urbanization, which has a shopping area with supermarket, hairdresser, chemist, bars and restaurants, the international school Lady Elizabeth Junior School and a extensive range of outdoor sports options with tennis and paddle courts, hiking trails, horse riding school, beach and coves with beach bars. Structure formed by load-bearing walls out of concrete blocks with slab floors with concrete joists and arched lightened concrete bricks, as to technical project. Façade closure consisting of outer wall with 20 cm thick concrete blocks, air chamber with insulating mineral wool panels and inner wall of 7cm thick ceramic bricks, according to technical project. Inner partition walls made of 7 cm thick ceramic brickwork. 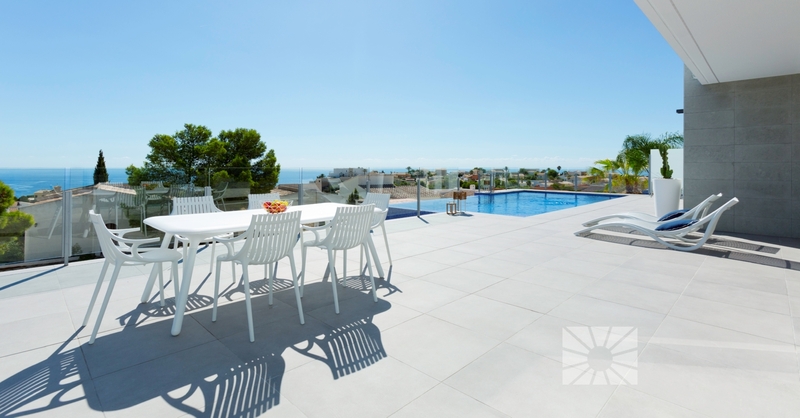 Non-trafficable flat roof, with a inclination provided by concrete layer, gravel finish and masonry perimeter railing, depending on the villa model. Thermal roof insulation with extruded polystyrene insulation boards over an EPD type rubber waterproofing layer. Thermic insulation of the floor inside the house by fitting approved insulating panels on floor slabs and covering with a layer of selflevelling concrete prior to tiling. Thermic insulation of the floor inside the house by using polistyrene units in the first floor slab. Thermal insulation of terraces above the property with extruded polystyrene insulation boards over an EPD type rubber waterproofing layer. 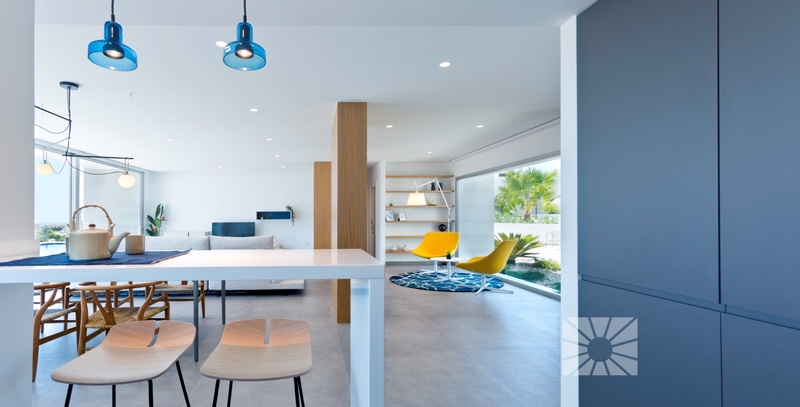 Interior walls surfaced with sprayed plaster with smooth finish, painted with plastic white paint, except kitchen and bathrooms, according to technical project. Continuous plasterboard false ceiling in bathrooms and kitchen, and where necessary for feeding through electrical installations, according to technical project. Fitted electrical installation carried out in accordance with the electronic regulations for low tension, with first quality make fuse box, prepared for contracting 9,2 kw, as to technical project. Electrical swith and socket boxes in white or ivory, by SIMON series 75 or JUNG series LS 990. Hot and cold water installation with embedded piping in compliance with current applicable regulations, with closed loop hot water circuit, main shutoff valve and independent shutoff valves for each bathroom. Solar energy water heating system, aided by an ALTHERMA by DAKIN auxiliary system. Washing machine connection, as to plan. Bathroom fittings series HAPPENING in white by ROCA in the main bathroom. SURESTE-N model ROCA acrylic bath tub measuring 170x75 cm, in white, according to technical project. Extra-slim 100x75 shower tray model MALTA model by ROCA, in white, according to technical project. ONDA PLUS by ROCA bathroom accessories in white: towel rail, toilet paper holder and coat hook. Kitchen sink out of stainless steel model CUMBRE by ROCA with two basins. Single handle chromed mixer tap on the kitchen sink from the MONOJET series by ROCA, with swivel spout and pull-out hose. Multifunction oven with timer, finished in white or stainless steel, model ROMAN-H150 by EDESA, or similar. Touchcontrol glass ceramic hob, model ROMAN-VT140LB by EDESA, or similar. Decorative 60 cm wide extractor hood with 3 speeds, stainless steel finish, model "POP-CDT60X" by EDESA, or similar. Standalone microwave oven, in stainless steel finish, model MW 21 IMS by TEKA, or similar. 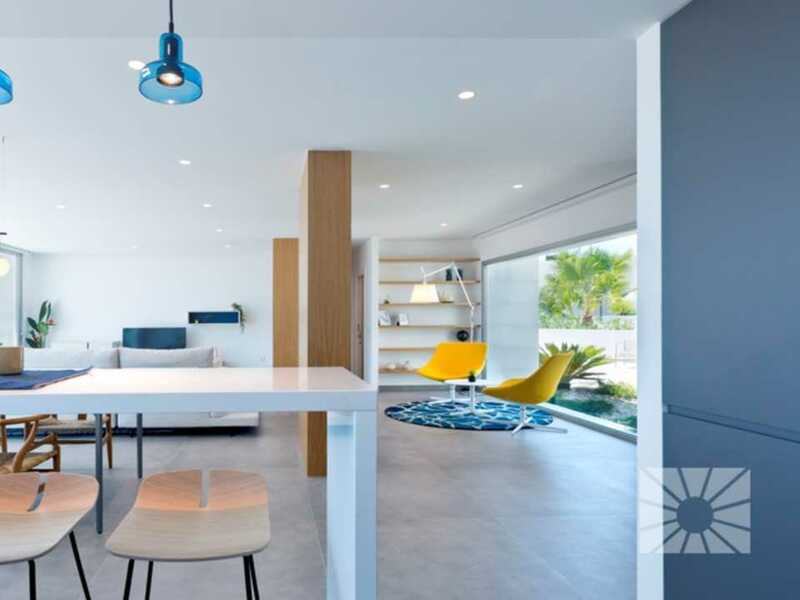 Simultaneous air conditioning and hot water production system by ALTHERMA of DAIKIN, made up of an exterior heat pump and an interior Hidrokit, that can be connected to Fan Coils of Air conditioning and to Radiant floor heating. Pre-installation for Air Conditioning by Fancoils, consisting in the installation from the sanitary underbuild of the house up to the living-room and bedrooms with corrugated and multilayer pipes for future electrical connections and Altherma circuit. 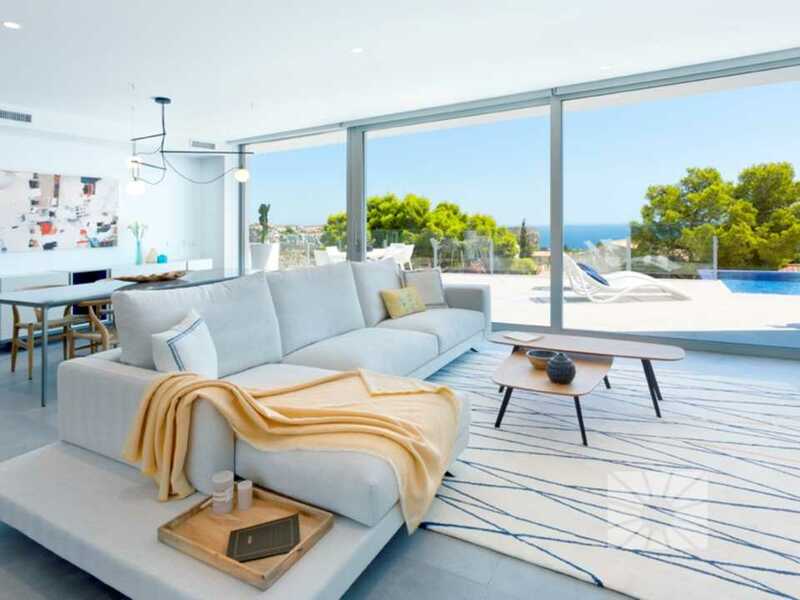 Ventilation system of the dwelling by means of the installation of air inlet grilles in the facades of lounge and bedrooms, with mechanical extraction of the interior air through pipes from the kitchen and bathrooms towards the chimney on the roof. Device where the house's interior network is centralized, made up by different connection points (TV, TF, TLCA, PT) that allows users the possibility of accessing the different services provided by the operators. Television connection lead by cable to the UAP from the lounge and master bedroom, as to plan. Telephone connection lead by cable to the UAP from the lounge and master bedroom, as to plan. Computer connection point RJ45 lead by cable to the UAP from the lounge and master bedroom, as to plan. Reserved hidden connection lead without cable to the UAP from the kitchen and other bedrooms, as to plan. 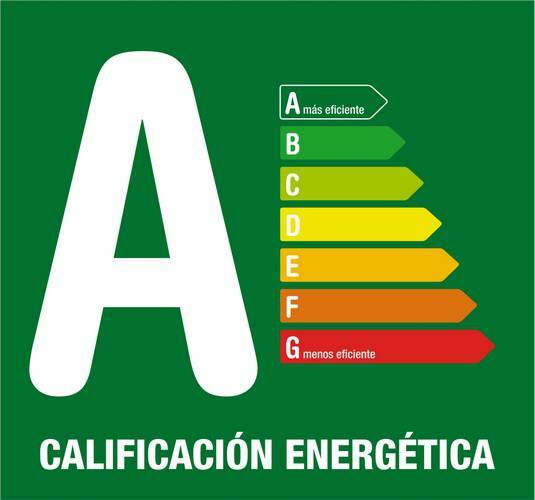 Solar thermal panels to produce hot water in compliance with the current regulations. Alarm system consisting of the basic Kit installation formed of the central alarm box with anti-sabotage protection detector, keyboard control, 2 movement detectors and remote control, posible connection to alarm reply centre. 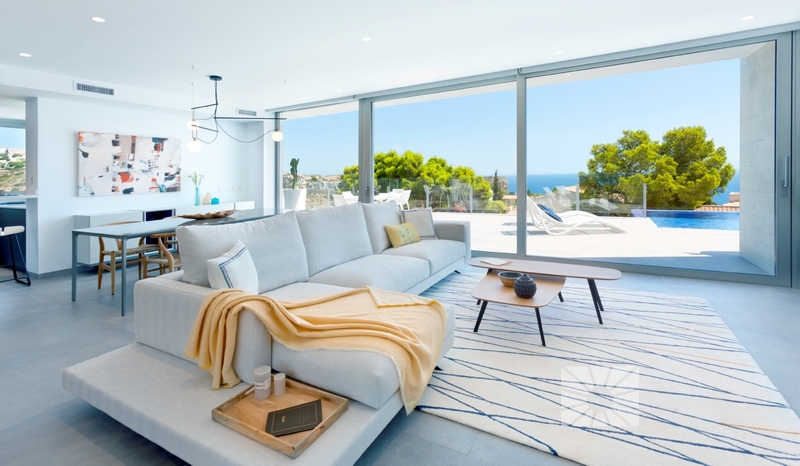 Top quality exterior windows and doors of Swedish pinewood or lacquered aluminium. Double glazing with CLIMALIT air chamber and tilt-and-turn mechanisms on windows in kitchen and bathrooms, according to technical project. Main door with safety frame of ALUMINIUM lacquered white, PVC in white, or solid swedish pine WOOD, with safety lock of 3 or 5 points of anchorage, as to technical project. Fully lined wardrobes with modular melamine interiors, equipped with a top shelf and a rail, 2.2 m high sliding doors matching the interior room doors, according to technical project. Windowless single hinged interior doors of solid Swedish pinewood with PROVENZAL style finish, or of oak wood veneered solid panels with a choice of several different designs and finishes. BATHROOMS and KITCHEN walls tiled with top quality ceramic tiles to be chosen by the client from series no.2, including 2 decorative border tiles in the bathrooms and 1 in the kitchen. (Limit of 1 tile model per KITCHEN-BATHROOM). The house has an insurance that guarantees any damage made to the house due to faults and flaws caused by or affecting the foundations or structure of the building and that threaten its resistance and safety, for a period of 10 years. Warranty of the amounts of money handed over by the client by means of a bank guarantee or consolidation policy issued by an important bank or insurance company. Own Architecture Department where you can design your personal project or adapt some of our recommended designs. Freedom of choice of materials and finishings of your house. Customized service and advice by our Customer Service Department. Personalized follow-up service for the client from the contract signing until the conclusion of the guarantee period. Inspection for handing over of keys accompanying the client and providing customized service in several languages. Geotechnical study, Quality control plan of the project, Laboratory trials, monitoring of the quality of construction execution by an approved Technical Control Organization, professional direction by Architect and Quantity Surveyor. Technical inspection for internal control prior to handing over of the house to the client. Execution fees of the mains of the different supplies connections. Management of direct debiting of water, electricity and community receipts. Management of the Registration in the Land Registry. Private postbox in the postbox shelters of the shopping centres. Payment of the refuse collection tax of the year of the title deed signing. Payment of the Yearly Property Tax of the year of the title deed signing. Payment of the homeowners fees (community of owners previously existing) the year in which the deed is signed. 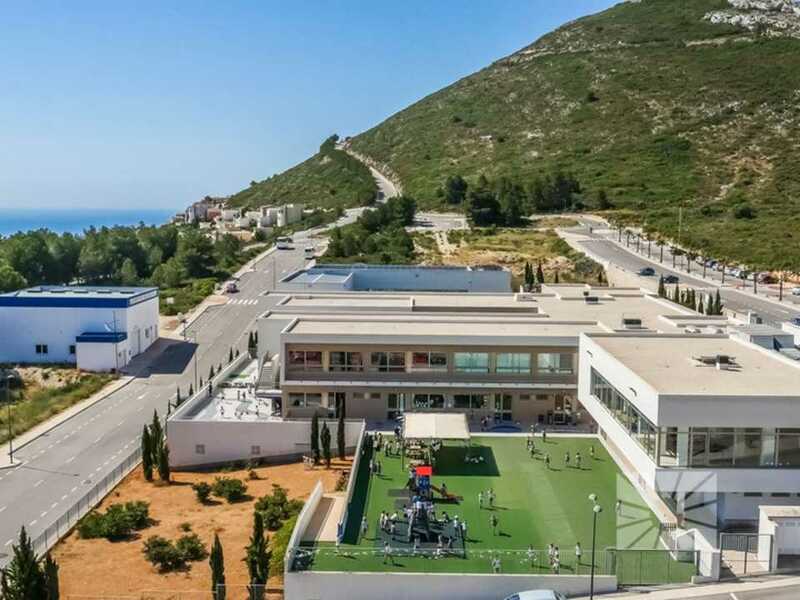 The Urbanisation Cumbre del Sol is provided with a telecommunications network infrastructure with PREWIMAX technology, prepared for providing telephone and high speed internet service. 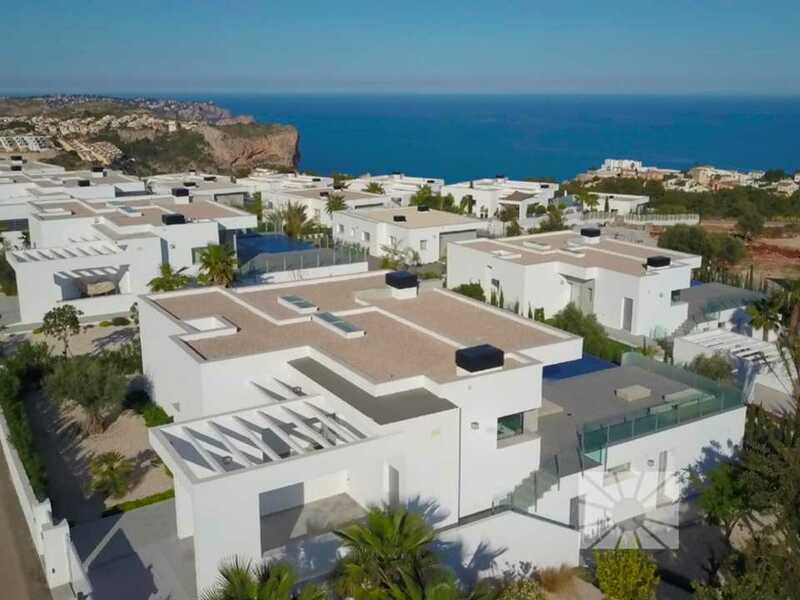 The houses located on RESIDENCES PLUS plots, include an infrastructure different to the others, consisting in personalized street lighting, videosurveyance service by means of cameras installed in strategic points of the residential, asphalted pavements. 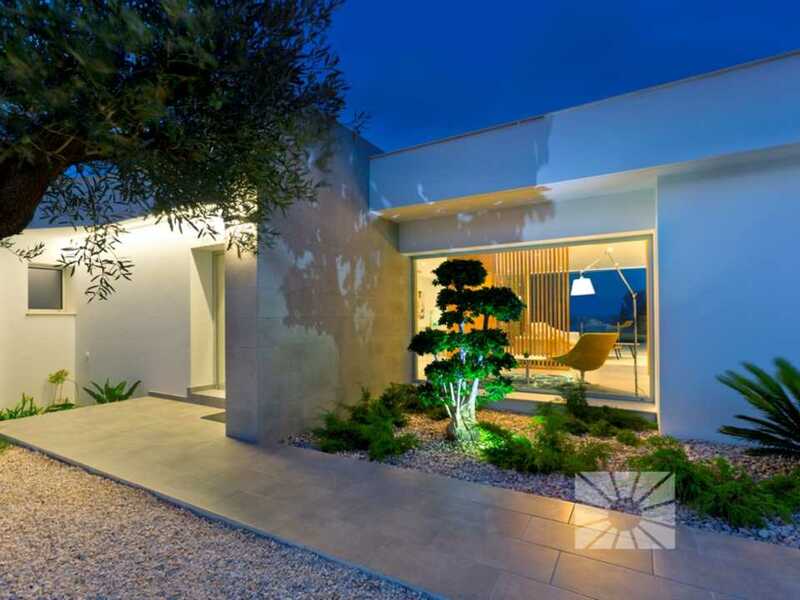 The client may include in the projects of these residences the following with no additional cost: individual satellite dish with analogic receiver, movement detector on the rear facade of the house and intercom from the entrance of the plot to the house. The Residences Plus "MAGNOLIAS" and "LIRIOS" will have a piped town gas infrastructure. 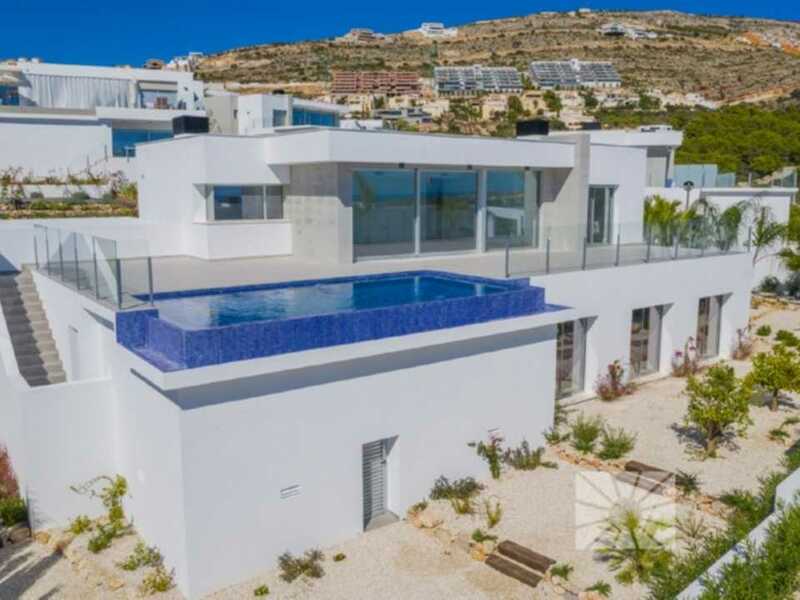 The minimum surface of the houses will be 150m2, they will have an annexed garage which is part of the house, swimming pool, terraces, with boundary walls to the street done in dry stone, accesses to the plot will have to be protected by gates or similar. 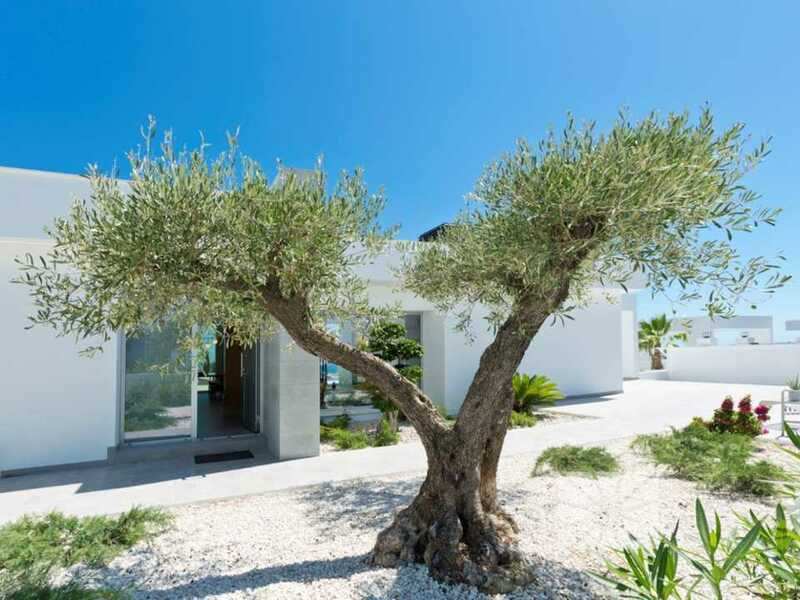 The client obliges himself to plant a perimeter hedge around the whole plot and to invest a minimum of 18.000 Euros in the garden. A dynamic and innovative business group that concentrates all its efforts and dedication to achieve full customer satisfaction by adopting a commitment to quality in its processes, products and services. 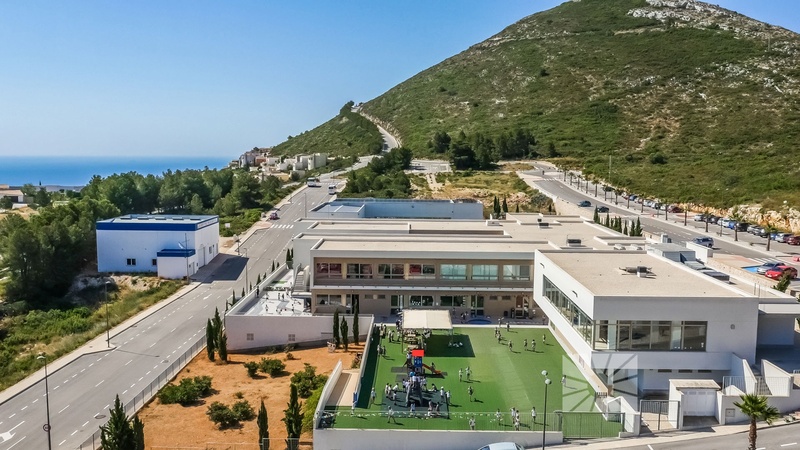 The more than 8.000 homes built in 14 housing estates, bought by people from all around the world are living proof of the experience and know-how of the VAPF Group.